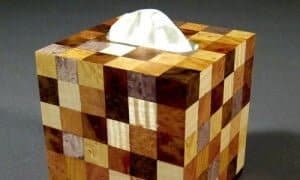 Whether you’re nursing a mean cold, feeling the aftereffects of a bad breakup, having a terrible day, or watching the latest made-for-TV tearjerker, one trusty item you can always count on is a box of tissues. A box of soft tissues can be comforting during moments that are emotional or downright miserable. Why not house them in a decorative tissue box cover? Making a decorative tissue box cover is a quick and easy way to transform a functional item and add some instant charm to your room. And who knows – taking a tissue from a beautifully decorated box just might brighten up your bad day. Grab your tissue box cover and wrap it with adhesive contact paper. Use scissors to create the opening for the tissue. Cut a length of ribbon long enough to wrap around your tissue box once and tie the ends into a bow. Trim the ends. Secure the ribbon to the box by applying small pieces of double-sided tape.